23.30 Arrived at Kuala Lumpur International Airport – collect baggage and Malaysia’s Immigration clearance, Free time – shopping at the KLIA’s kiosks or taking a nap while waiting for connecting flight to Krabi at 0710hrs. 07.10 Depart from KLIA, Kuala Lumpur via AirAsia to Krabi, Thailand. 07.30 Arrived at Krabi International Airport – collect baggage and Thai’s Immigration clearance. 08.00 Pick up by van for the Krabi’s city sightseeing tour. 12.00 Lunch at the selected local restaurant. 13.00 Transfer to the appointed hotel at the Aonang Beach. 13.30 Check in to the hotel’s room and leisure time, free and easy. 16.00 Pick up by tuktuk to the Weekend Night Market in Krabi’s town. – enjoy the street entertainment and street food at the Night Market. – Walk around at the Aonang Bazaar for souvenir and street food while waiting for 7 Island Tour in the afternoon. 13.00 Pick up at the Hotel’s Lobby for 7 Island Tour and the Sunset. – During the trip you will be enjoyed the activities such as swimming, Snorkeling, cliff climbing/jumping, watching the sunset and swimming with the bio-luminescent plankton. 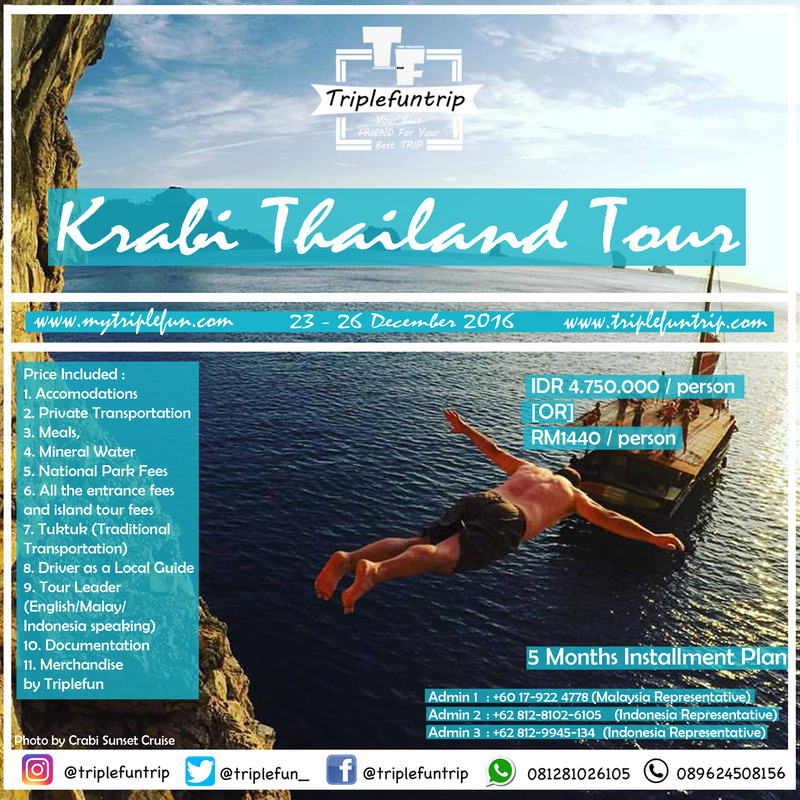 – Tour will be visited Phra Nang Cave – Koh Tan Ming – Koh Si- Koh Tub – Chicken Island – Poda Beach – plankton stop. – BBQ Dinner & Snorkeling equipment will be provided during the trip. 21.00 Back to the hotel and take a rest. End of tour of the day. – Klong Thom Hot Spring – you can bathe in the natural jaccuzis. – Emerald Pool and Blue Pool – you can swim or explore the surrounding the forest. – Elepant Trekking – 30min trek through a shady forest and along a river, after you can interact with and feed the animals. – Lunch is provided during the trip. 17.00 Back to the hotel. Walk around the Aonang Bazaar or enjoy the street food for the dinner. 11.00 Transfer to the Krabi International Airport by Van. Peserta dilarang keras membawa senjata tajam dan obat-obatan terlarang. Peserta di harapkan atau di wajibkan mengerti seluruh ketentuan di atas. *Pendaftaran trip ini bias di cicil sesuai arahan yg kami berikan atau silahkan jika ingin lebih sesuai kemampuan Masing2 peserta.